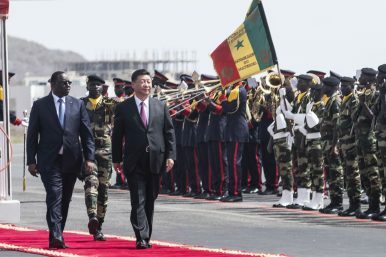 Senegal president Macky Sall, left, and Chinese President Xi Jinping, inspect the honor guard during a state visit in Dakar, Senegal (July 21, 2018). In Senegal, Rwanda, and Mauritius, China pursues Belt and Road agreements — with mixed success. Everywhere Chinese leaders go, the Belt and Road follows – in speeches, if nothing else, but also often in investment agreements and even formal diplomatic documents. That was the case last week as well, when Chinese President Xi Jinping took a four-country tour of Africa, stopping in Senegal, Rwanda, South Africa (where he also attended the BRICS summit), and Mauritius. According to the summary of Xi’s trip from Chinese state news agency Xinhua, “the signing of cooperation documents regarding the Belt and Road Initiative” was a “key achievement” of Xi’s trip. In a statement on the agreement, China’s Foreign Ministry pointed to Senegal’s “unique geographical location,” making it “a key extension of the Belt and Road.” Chinese Foreign Minister Wang Yi said separately that China hopes Senegal’s participation will have “a driving effect” for the BRI in West Africa. The BRI to date has focused more on East African countries (like Kenya), which form a more natural geographic link with the Maritime Silk Road stretching from East Asia westward through the Indian Ocean. Xi also oversaw the signing of BRI cooperation agreements during his time in Rwanda. Rwanda’s President Paul Kagame, in an interview with Chinese media, noted how Chinese infrastructure investment in the eastern part of the continent has benefited his country. China is, for example, helping fund a new standard gauge railway in Tanzania, linking the port of Dar es Salaam to landlocked neighbors like Rwanda. As yet, however, there has been no agreement to extend the standard gauge railway into Rwanda itself. That may reflect caution on Rwanda’s part – the small country has kept limits on the number of Chinese workers allowed within its borders, for example, and like other BRI participants is wary about the prospect of falling too far into debt. Mauritius has close ties to India, and officials have previously indicated that they want to avoid having to choose between Beijing and New Delhi. India has been one of the BRI’s most vocal opponents, as the initiative’s branch in Pakistan passes through territory that India claims. Officially signing on to the BRI could put Mauritius in an awkward position. However, Mauritius is openly pursuing closer economic cooperation with China, including free trade agreement negotiations, which opened in May of this year. Xi will get a chance to try again later this year – in September, African leaders will gather in Beijing for the Forum on China-Africa Cooperation. China will be hoping to seal a cavalcade of BRI agreements at that time, further linking Xi’s signature project to the African continent.